TechnicBRICKs: Which color is it? My friend Martyn Boogaarts (Robotica), had the chance to put his hands on a couple of these new 'Axle 3 with Stud' (6587) and sent me a photo. There we can see one, together with its 'Dark Gray' and 'Dark Bluish Gray' old brothers and one Tan axle pin. Unless there is here some mistake and this is not the final production part, it looks the newest element is not Tan colored! From the photo coloring, which may vary a lot with the lighting conditions, it is not easy to say if it is using any of the already existing and active colors (some kind of Orange or even a 'Dark Tan') or a totally new color. Perhaps we will need to wait and see. The 'axle 3 with stud' on the back of the helicopter looks like it's 'old dark gray', but is probably the new 'dark tan' color instead. Dark Tan does exist - sets like Bionicle's Avak from 2006 contained dark tan parts... and IMHO it does look a lot like Dark Tan. But a new color is also a possibility in my eyes. why would they introduce a new colour for this one measly little piece. I think it looks more orange in that photo than it will in real life (the tan colored 'axle pin' on the right also looks more yellow than it should). The 'axle 3 with stop' on the back end of the helicopter is clearly not an orange or 'caramel' color, but is instead more like a cross between dark gray and tan. The new color has to be dark tan - it looks exactly the same as 'tan', apart from being slightly darker. Anyway very interesting, I wonder what other Technic parts will get this color, if its the production part. I agree with Daniel: considering that the tan axle pin is much yellower in the photo, I'd say the axle with stud (not to be confused with axles with stop like the 8L and the new 4L) is dark tan. I'm already against the colour-coding of gears (except for aesthetic reasons where applicable), and think using yet another colour is an exaggeration! This makes building anything with exposed mechanics an ugly patchwork of colours. :( Why changing from dark grey? Regular axles are already either light grey or black (or red for 2L), dark grey wouldn't be confused! Great point regarding the instructions AVCampos. That would make the most sense and might even be a viable reason for TLG to change this part. But to echo yours and the above comments, that doesnt mean I like it. I compare the recent standard color changes to the 3L friction pin being changed to blue. That was viable and made sense (uhmmmm, okay, in an imaginary world where there wasnt a blue axle pin :), but I digress)...with the quantity of 2L and 3L friction pins and their presence in almost every instruction step. But unigue parts at only a few pcs per set, like the gears that are now tan, doesnt make sense to me. And Conchas, did Martijn get his hands on any other 2010 parts? The colours in the instruction manuals are, in my opinion, quite a big problem, and one that could be quite easily improved by the simple addition of letters to indicate colours in the PLIs. Many of the books with MINDSTORMS instructions that were published for the RCX are in black and white and use this method to distinguish between colours. It is true that every language uses different words for colours, but I don0t think that is a problem. You could even use a number system to indicate colours as long as it is referenced somewhere in the instruction manual with a picture of the real colour. Especially the difference between black and dark grey is often only clear by careful comparison to other steps. We (ambassadors) have passed the instructions color issue to TLG, we're waiting for a response. BTW am I the only one who actually likes color-coding?? I think they look cooler that way, maybe more toy-ish but cool.. I thought that instruction issue was sorted. At least in my experience the colouring of the instructions has improved to solve this problem. However if there is still a problem then surely the solution would be to improve the way in which instructions are coloured, not to change the colour of the part. Besides if a single part is coloured in all one colour (black parts having white outlines) and not shaded different colours to give a more 3D effect then surely each colour would be as easy to distinguish from each other as they are in real life. Being this part different from any other axle, and usually used into a set in one single color... I don't think that having changed the color to avoid difficulties reading the instructions, to be a plausible explanation. Would believe more easily, this color coding being motivated to facilitate part search inside a box full of parts. A Dark Tan color would indeed make it easier. However and despite understanding the virtues, I also do not like color coding. The colour coding of all these "obscure" elements has me a bit worried as a MOC builder. The more rigid TLG gets with the standardization of certain elements, the more pissed off i get. There. is. no. reason. 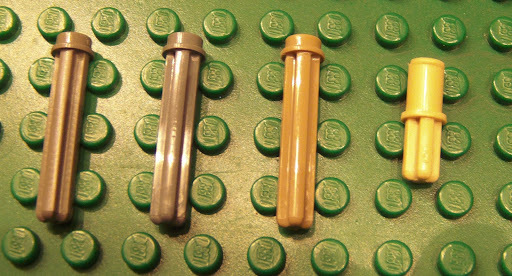 at ALL to no longer offer different colour options for such pivotal elements as the 3L pin, or the pin with axel, or WHATEVER. These "root" elements, the kind of element that connects all the other pieces together, are the most important ones to offer in various colours. I would probably be insane to create an entire MOC using black liftarms, but BLUE pins. Seriously now, its getting kind of ridiculous. At least if you're going to colour code these items, do it in shades of gray and black, not BLUE or TAN or DARK TAN. Thats no excuse to change the colour of certain elements to make indecipherable instructions.... decipherable. I've wondered if he gave up the fight :) as many Technic elements have since fallen victim as well.